When’s the last time you got excited about eating a fresh, delicious and reasonably priced meal at the airport? Sure, there are some obvious exceptions, like a trip to Lufthansa’s Wining and Dining facility or Etihad’s uber-exclusive Residence lounge at JFK, but for the most part, passengers only end up eating in the terminal if they don’t have any other choice — be it a long layover, a flight delay or a lack of options at an airport hotel (like that one time I got a gate pass to visit Tortas Frontera at Chicago O’Hare). First, there are the iPads. They’re all over the place. Like, literally at every seat, at restaurants and elsewhere in the terminal alike. You can use them to browse the web or check your flight status, but they also provide instant access to nearby dining venues, letting you order snacks, cocktails, full entrees — whatever you like. They’re fairly straightforward — you scan your boarding pass (if you wish) and browse food and beverage options. After you make a selection and pay (or open a tab), a waiter will bring your order when it’s ready. I have noticed some customers struggling a bit with the tablets, but employees are on hand to help navigate the interface (some seem more willing than others). 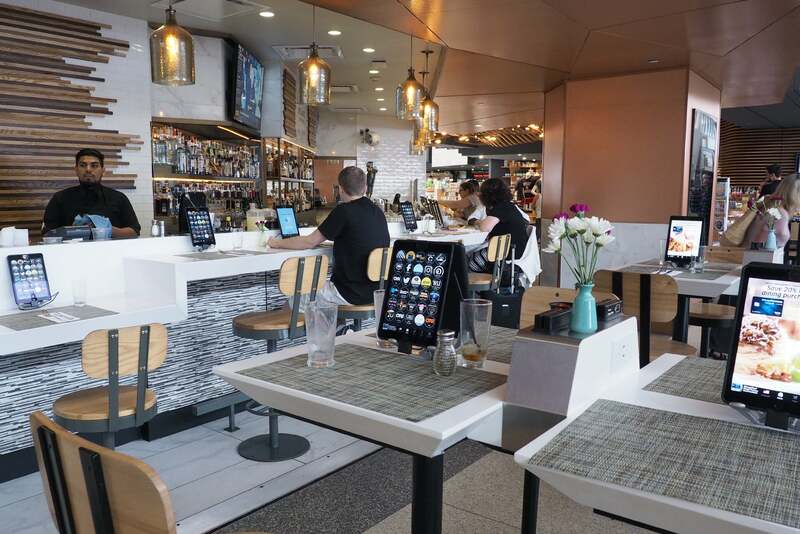 Best of all, if you have a co-branded United card, such as the United MileagePlus Explorer Card (and you’re flying from Newark Terminal C), you’ll get 20% off all F&B purchases through the iPads — and yes, you can pay with your Chase Sapphire Reserve to earn more points. I used my $40 voucher at Daily, a new restaurant at Terminal C where the menu changes every day. My scallops were great, but perhaps I just lucked out during my visit. 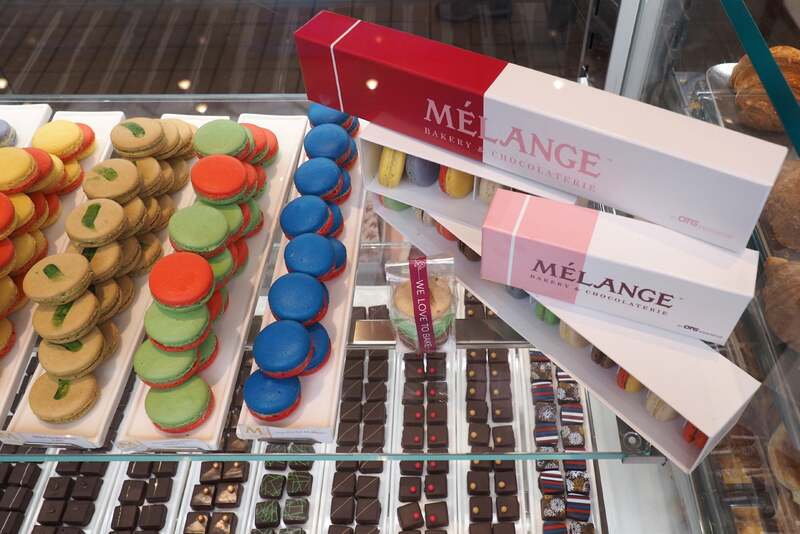 Meanwhile, if a consistent offering is more your thing (generally it’s mine, since I like knowing what to expect in life and dining venues), I recommend Mélange. 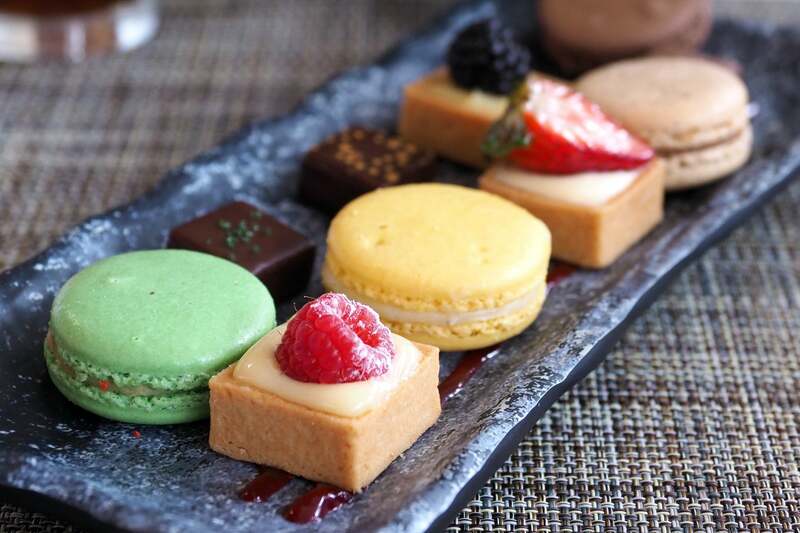 The new restaurant section has some great savory picks (which I got to try out during a media event this week), but the highlight is definitely the bakery — the pastries, macarons and chocolates are all outstanding. Yeah, that’s right — I’m pretty sure the croissant I just ate at Newark Airport was at least as good as any I’ve had in France. 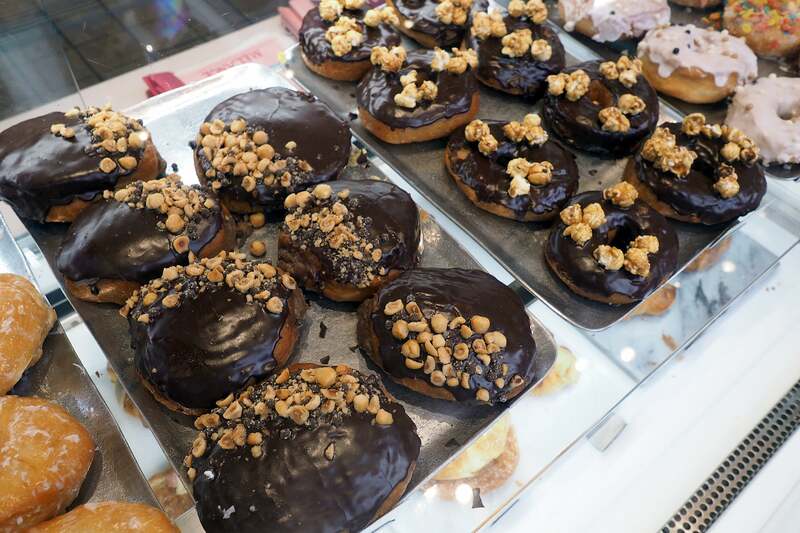 There are also some crazy looking donuts ($4) — everything from Boston Cream to Maple Bacon (yum!). 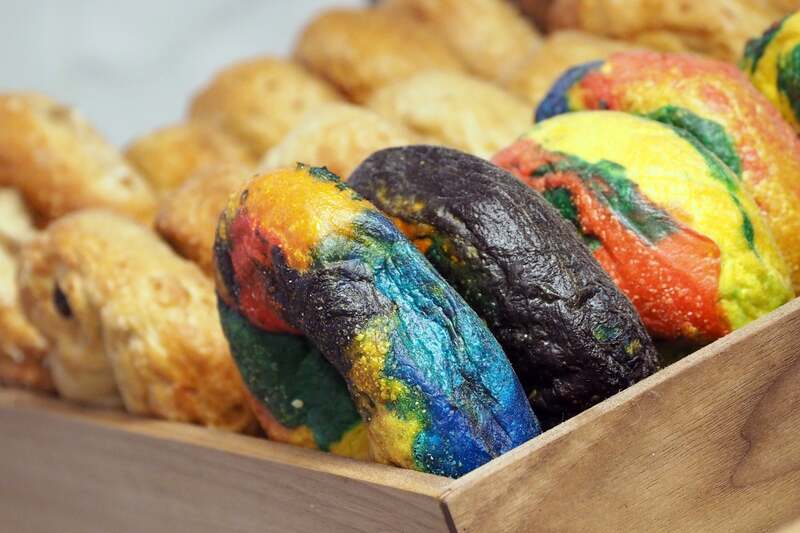 And a dozen varieties of bagels ($1.75 each), including the usual suspects (everything and cinnamon raison) and some you might be less familiar with, like bacon & parmesan and rainbow. You can order from the counter, but you’ll have a bit more flexibility if you make your selection at an iPad — there you’ll be eligible for a 20% cardholder discount, and you can redeem miles for your purchase as well, albeit at a paltry 0.8-cent valuation, a mere 53% of the 1.5-cent valuation we assigned to United miles. A bagel (with spread) will run you a bit more than at the counter though, at $4.25 or 540 miles. If you’re a cardholder, that drops to $3.40 or 432 miles with the 20% discount, before factoring in tax and tip. Well, what makes Mélange unique isn’t just the fact that the pastries and other goodies coming out of the kitchen are so good that you might end up stopping there to pick up some treats before (or even after) each flight… what’s really special here is that the bakery operates 24/7, with the staff of 50 or so employees working in three shifts around the clock to produce more than 1,000 croissants and other pastries, 1,200+ bagels, 600+ muffins, dozens of cupcakes, hundreds of macarons, eclairs, donuts, chocolates and other items every day. 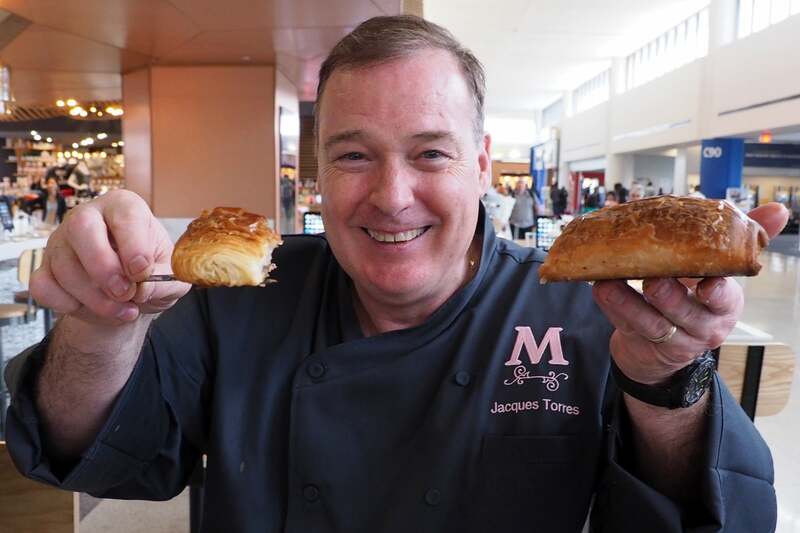 If you happen to pass by after your delayed flight arrives at 3 in the morning, you’ll see a dozen or so employees hard at work, prepping and baking tons of items for sale the next morning — either at the bakery counter, the restaurant or some of the other 55 restaurants at Newark Terminal C, where you’ll also find items from Mélange. 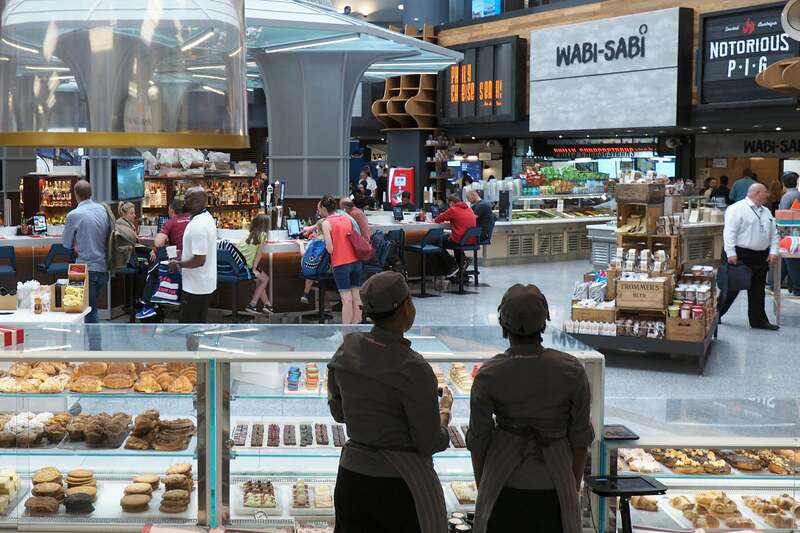 Meanwhile, if you’re after something else, EWR now has plenty of alternatives on offer, ranging from steaks at Saison to BBQ at Notorious P.I.G. Just be sure to scan your boarding pass before you order — that 20% discount for co-branded cardholders is hard to beat. And even though customers have so far redeemed more than 500,000,000 miles through these tablets, I recommend saving them for travel — with the OTG terminals offering 0.8 cents per mile in value, you can do much better with just about any other redemption.